Fr Charles Menezes hails from India. 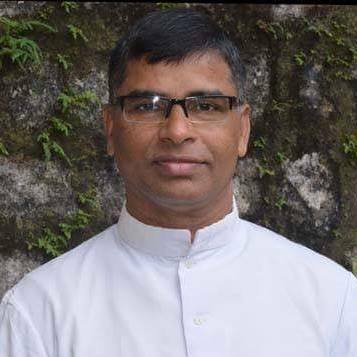 Ordained Catholic Priest for the Diocese of Mangalore before he was incardinated into the Diocese of Udupi after the bifurcation of the Diocese in 2014. He was born in Moodubelle from Udupi, Karnataka on 18.10.1963. He did his Primary and High School studies in his village, Church Aided St Lawrence School. He did his Pre University studies in Porna Prajna College Udupi, before he joined the St Joseph’s Seminary, Mangalore in 1982 and was ordained Priest on 8.5.1991. Along with his seminary studies in Philosophy and Theology, he also obtained a Bachelor of Arts Degree and a Master of Arts in Sociology from Mysore University. He worked as Asst Priest in 3 parishes namely Agrar, Kulshekar and Vittal for 6 years. Then he was appointed as YCS/YSM Director of Mangalore Diocese to take care of the faith formation of teenagers. He worked as the first independent Director of this Movement for 8 years. Then he was appointed Parish Priest of Neermarga where he worked for 5 years before his appointment as YCS/YSM India National Director. He worked at Chennai and New Delhi for 5 years and made great effort to revive the Movement all over India. Before finishing his term of 6 years he was elected as International Chaplain of IYCS in June 2015 which was confirmed and approved by the Holy See through the Pontifical Council for Laity dycastery on 24th July 2015. His tagline of life is « Service with a Smile » which suits his character. Thousands of students who have been trained by him in the Movement, in his Diocese and Nation, spread all over the universe bear witness to his service to the young adults. He has remained very young because he is always with the youth.